For Your Business - Energy cost can be a significant component of your overhead. 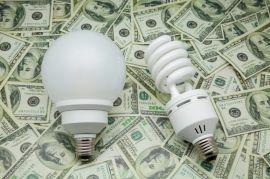 Drive more profit to your bottom line by controlling how much you pay for electricity. As a business owner, you are always thinking of ways to better manage overhead and improve your profit margin without impacting your employees or increasing your price to your customers. Let us help you achieve this important business objective with little effort! To choose the best plan that is right for your business, simply click the large button "Small Business - Improve Your Bottom Line" along the right column of this page. Fill out the information that is required by the utility commission and your utility company in order for us to get you enrolled. We will then send you a confirmation email repeating all the specifics for your file. Be assured that your information will be kept strictly confidential and will not be used for any other purpose. We will not disclose or share your information with any other party except with your utility company for the sign-up process and managing your account. If your business has multiple meters/service locations that you feel it is too cumbersome to sign up one location at a time online, or if you have specific questions not answered by this website, just give us a call at 888-565-4490 to speak with a friendly customer service agent. If you reach our voice mail when you call during off hours, please leave your name and contact information and we will call you back promptly. You may also email us at CustomerService@4ChoiceEnergy.com.